Gov. Francisco Domínguez Servién from the state of Querétaro, Mexico, met Premier Kathleen Wynne Nov. 9. A governor from Mexico has wrapped up a quiet two-day trip to Ontario designed to seek investment from the Canadian auto sector and strengthen trade relationships between the two. Gov. Francisco Domínguez Servién from the state of Querétaro, Mexico, met Premier Kathleen Wynne Nov. 9 and Automotive Parts Manufacturers’ Association (APMA) President Flavio Volpe Nov. 10. In a statement, the premier shed little light on the discussions, including whether U.S. president-elect Donald Trump’s call for changes to the North American Free Trade Agreement (NAFTA) were on the agenda. The premier did say Nov. 9 that she was concerned what might become of the 22-year-old NAFTA under Trump, who wants it terminated. 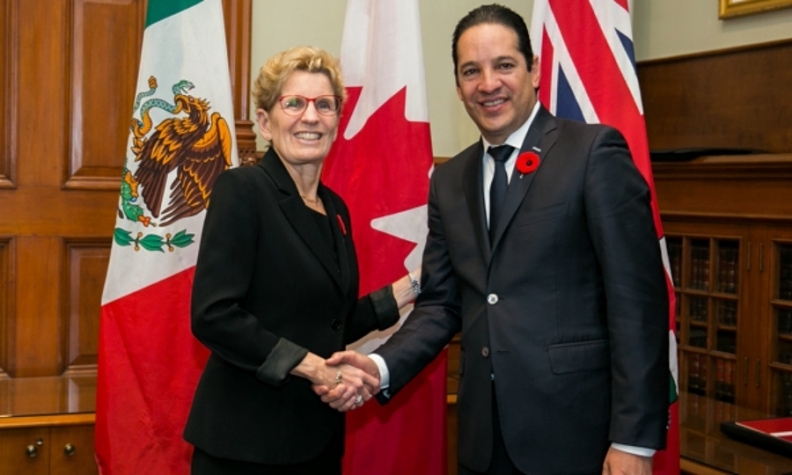 “Governor Domínguez and I met to discuss trade opportunities between Ontario and Querétaro and to explore new areas of collaboration,” Wynne said. The government did not respond to requests for additional information. Volpe said it was an important outbound trade mission for the governor. The APMA estimates that 25 Canadian auto parts makers operate upward of 50 facilities in the state of Querétaro. Canadian auto investment there represents 40 per cent of total automotive investment in all Mexico, Volpe said. That’s because Canadian parts companies need to be where the business is as OEM customers for Canadian parts companies have expanded rapidly in Mexico over the last decade, Volpe said. Since 2014, Toyota Motor Corp., Daimler AG, Mazda, and Ford, to name a few, have made or promised major investment in Mexico. Those are key conditions for companies to get parts to their customers, he said. Volpe would not say what, precisely, he and the governor discussed. He would only say he was acting as a liaison for some parts manufacturers that his association represents and the state of Querétaro.